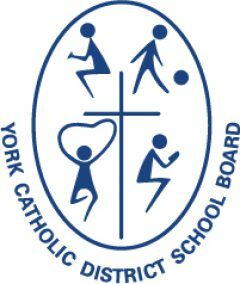 YCDSB congratulates Holy Cross Catholic Academy’s Junior Boys Soccer Team, which recently claimed the York Region Athletic Association Championship. 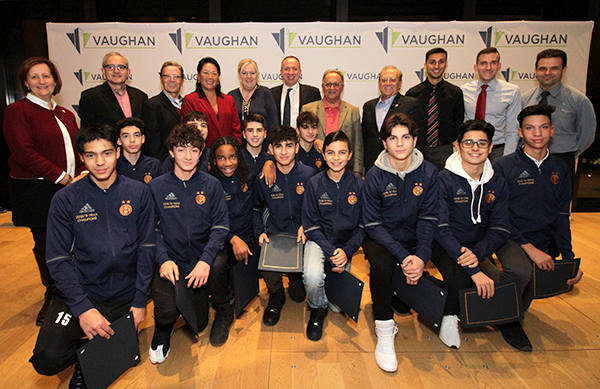 The team was invited by the City of Vaughan to its Committee of the Whole meeting on December 5, 2018, to be formally recognized by Vaughan City Council. Mayor Maurizio Bevilacqua told the team, “I am proud to offer my congratulations to the Holy Cross Catholic Academy Jr. Boys Soccer Team on their recent York Region Athletic Association Championship – the school’s first in more than 20 years. Sports is truly a unifying force for good and when teams, athletes and participants – from any number of athletic disciplines – achieve greatness, it is often a result of the collective efforts of many. These Grade 9 and 10 boys are deserving of our recognition for demonstrating what can be accomplished through hard work, dedication and leadership. Holy Cross Catholic Academy is a publicly-funded high school in the City of Vaughan’s Woodbridge community, administered by the York Catholic District School Board. Holy Cross CA offers a wide array of educational programming to students in Grades 9-12, including the High-Performer Athlete (HPA) Program. The HPA Program is an academic-based program for student-athletes who participate in regional, provincial, national, or international competition. Students benefit from a flexible timetable to help balance their academic and athletic commitments, and earn high school credits for the work they put into their training.